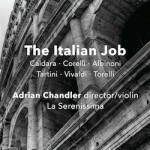 “My heart skipped a beat when [The Italian Job] from La Serenissima and Adrian Chandler landed on my desk, such was my enjoyment of their Gramophone Awards-shortlisted Vivaldi Four Seasons recording (AV2344). 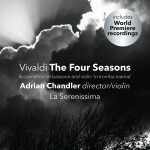 So to discover that with this all-Italian assortment of sinfonias and concertos they’ve actually topped their 2016 triumph – and apparently effortlessly – gives me no small amount of pleasure.” So said the reviewer of the Gramophone Award-winning release, and the Vivaldi specialists are set to triumph once again with Vivaldi x2, an astonishing medley of double concertos for hunting horns, oboes, bassoon, violin and cello. 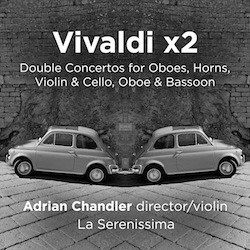 Emenating from Vivaldi’s pen the double concerto – a genre of which he all but cornered the market – resulted in some of the composer’s most colourful and exuberant works. In the hands of two-time Gramophone Award-winning La Serenissima, these concertos come to virtuosic and effervescent life.